One of the items on my “purchase” list is an area rug for my entry way. When I found out I was able to work with Mohawk I knew this would be the chance to get that taken care of! What I didn’t realize was the amazing selection I was going to have to choose from. Personally I think companies shouldn’t give us so many beautiful ones to choose from because I could go broke getting runners and area rugs for each room in my house! Yes, that’s a backhanded compliment. I ended up having to close my eyes and pointing at the one I was going to get between my two top choices. Ohh the pressure! Unbelievably, my 5’x8’ Multicolor Select Linen Area Rug arrived just a few short days later! That was one package I was bursting to open up! So I lay down the area rug in the entry way and left it there for the day. Then I started to think that my new area rug was just too nice for the entry way. So, I dragged it upstairs to the living room where it's been laying for a couple of weeks. The only thing is, I keep wondering if I should take it back down to the entry way and I just jumped the gun too soon with moving it. The problem now is, I'm totally used to it in my living room and my boys seem to like it there as well. Looking at the photos above has me wishing I had two of the rugs. Man, I could've gotten the other area rug if I'd have known finding where my new one belonged would be such a tough choice! Now that I have the Multicolor Select Linen Area Rug in my living room, I want hardwood floors to compliment it. A girl can dream, right? 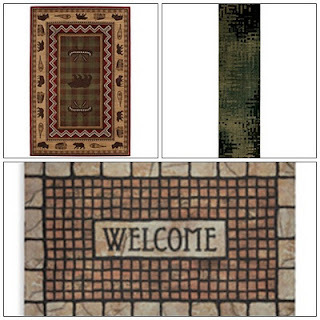 What I like is that there are rugs for every room for the home! I also love that Mohawk has the GreenWorks line! "One out of every five PET plastic bottles recycled in the United States are recycled by Mohawk." They also recycle rubber by making products out of them as well! "In 2009, we diverted over 18 million pounds of rubber tires, one of the largest and most hazardous types of post-consumer waste, from landfills and brought them to homes as designer doormats." Now you have the chance to win a 5'x8' Mohawk Area Rug thanks to Mohawk! I would LOOOVE the Asian Branches one I saw at Target. It would soften up my living room nicely! I would get the Mohawk Star Rug in Chocolate/Creme! Super cute for my babies room! I love the Mohawk Home Hidden Escape Rug. I checked Kohls...they are on sale there! Item #: 355419 | Model #: RG312-460-5 (http://bit.ly/q4yzYl) - I love those colors and the pattern. I'd love to add the Mohawk Home Villetta Butter Red to my home! Mohawk Home 10' x 13' Dark Brown Barbados Area Rug is the first one that caught my eye and looks like it'd hide kid stains fairly well. I love the Cordell Crimson 5'x8'. I like the Multicolor Casual at Lowes. I love the Mohawk Home 10' x 13' Praline Eclipse Area Rug. It would look really good in our living room. I like the Mohawk Home 5'3" x 7'10" Brown Patton Area Rug. looked through lowes because my hubby works there. The Mohawk Home Skyways Woven Rug is the one I want. I really want the Mohawk Home 5'3" x 7'10" Red San Marino Rust Area Rug. And since looking and finding that, I want to win this contest even more than when it first caught my eye. I love the Mohawk Home 5' x 8' Valence Select Strata Area Rug! I would get the Mohawk Home 5' x 8' Red Kodiak Area Rug. i love the paisley rugs! I like the Kinectic Source rug! I'd choose Picasso Wine 8 ft. x 10 ft. Area Rug. I loved its 'artsie look'. Love the Forbidden Entry design. But I'd need about two hours to pick one. I like the Praline Eclipse Area Rug! I chose Mohawk Home 5' x 8' Chocolate Premiere Area Rug. It would look real nice in my son's room. I need a new area rug in my living room BADLY! I would love the Mohawk Home 10' x 13' Copper Masterpiece Area Rug! :) Thank you! They have so much too choose from. I do like the Frise Shag Starch 8 X 10 sold by Home Depot. I love the Mayan Sunset Sierra! Oh, my goodness - you are so right! Lowe's has a phenomenal selection! So hard to choose; there were dozens I loved. However, I do very much need an updated runner for my foyer so, with that in mind, I would select item # 176843 the Easton Med Beige. Gorgeous! Of course, then I would need to get the larger companion piece for my dining room and smaller pieces for at the front door, as well! The Mohawk Home 5' x 8' Tigress Select Woodgrain Area Rug would look perfect in our living room - we have a safari theme going already! OMG So many to choose from and I am bad at making decisions! Any that have brown or green in them are ones that I would choose and I like square designs too! I love the Sunshine Seeds design! That Mohawk Home 8' x 10' Red Midtown Area Rug would be perfect in my living room! I think Mohawk Home 5" x 8" Multicolor Select Canvas Area Rug from Lowes. I can't decide!!!! Loved the paisley in the Capital Elements...just don't know if it comes in a 5x8 and then, WHERE to use it???? I like the Mohawk Home 5" x 8" Multicolor Select Canvas Area Rug! The Mohawk Home Multicolor Select Cambridge Rug would look great in my livingroom! I love the Mohawk Home 5'3" x 7'10" Bungee Cord Midtown Area Rug. It would look great in my bedroom. Mohawk Home Hidden Escape pattern is my favorite. I love the leaves on it. I like the Dark Brown Barbados from Lowe's. I'm really liking the aqua fusion rug! I really like the Mohawk Home Mulicolor one. So many to choose from though!! Hello, I like the Mohawk Home 5'3" x 7'10" Multicolor Casual Area Rug from Lowes. Thanks for a great giveaway! I like the Hidden Escape rug. I like the Mohawk® Home Florentino Rug from Kohls. It's reeeeally hard to choose but I LOVE the Select Canvas Bangkok style! Love "Summerfield" (Lowe's name for it at least) - lodge style rug. I like the aqua fusion rug. I really could use a new rug!! Mohawk Home 8' x 10' Copper Nugget Shimmer Area Rug from Lowe's it would go perfectly in my bedroom, it matches what I've envisioned for the room perfectly. I *think* I'd choose Danger Zone. It's so hard to choose, though!